If you thought that the children of dietitians spring forth from the womb with a congenital love of orange vegetables, you would be mistaken. 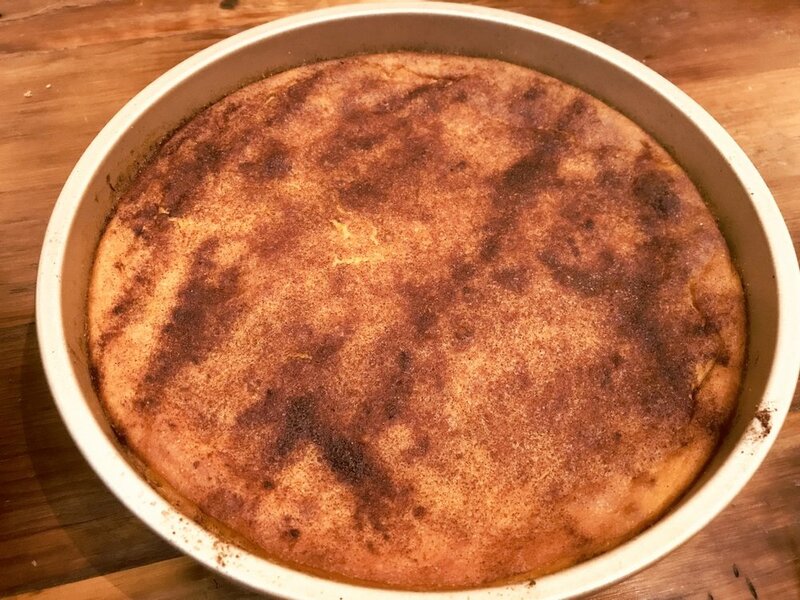 I've been cooking for my littles for almost seven years, and they've yet to embrace winter squash... with the exception of this recipe for Butternut Squash Souffle, which we call "squash cake" at home for marketing purposes. Yes, it's got added sugar in it, which makes it less righteous than, say, a kale salad. But I surrendered my moral high ground when I traded in my Prius for a minivan. So my kids eat a vegetable that's been enhanced with sugar. Judge me all you want. I think they deserve at least half credit. Squash souffle a great fall side dish recipe for your Thanksgiving table and holiday potlucks. Leftovers make a lovely brunch base: top with eggs, melted cheese, leftover grilled asparagus spears or anything else you can think of. In a separate bowl, beat the eggs and then add in flour, 1/4 cup of the sugar, oil and milk. Beat until well combined. Bake for 30 minutes, then remove from oven to sprinkle top with cinnamon/sugar mixture. NOTE: If you serve it still warm, the souffle will be yummy but have an un-formed souffle/spoonbread type consistency. If you serve it fully cooled (or refrigerate overnight and reheat the next day), you can cut it into squares or wedges and they will hold their shape like a cake; hence the nickname "squash cake." 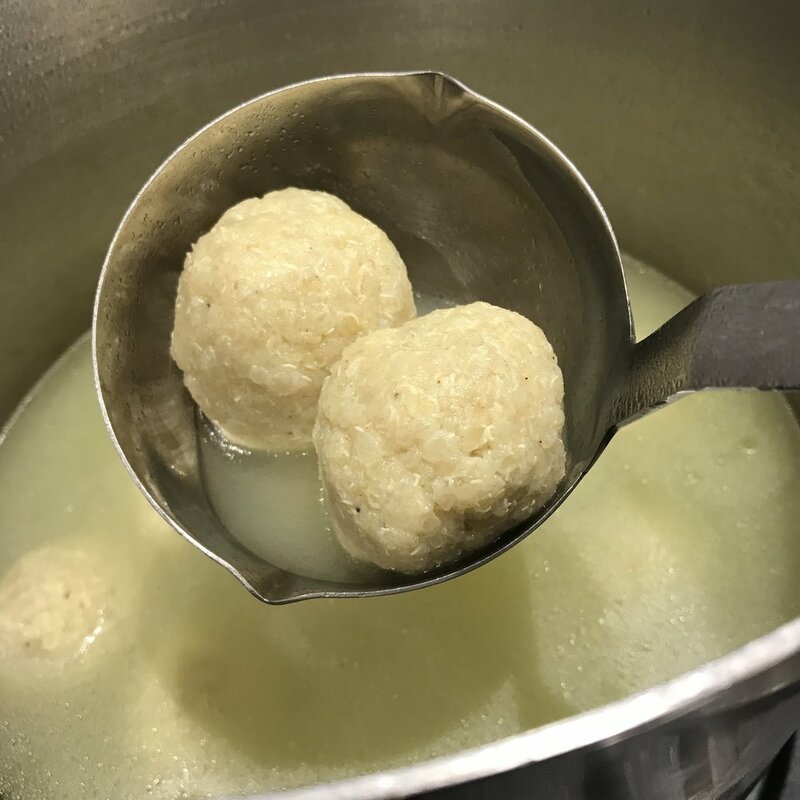 Of course, for those of us who can no longer partake in matzoh or its glutinous derivatives such as the matzoh meal used to make matzoh balls, the soup course of the Passover Seder is a sad, sad time. What’s more depressing than spending two hours recalling your ancestors’ persecution and suffering, only to be served a steaming bowl of plain, matzohball-less broth? While I’ve tolerated this indignity in years past, I decided that this year, it was time to MMODGFMB. That’s Hebrew for: make my own damn gluten-free matzoh balls. Enough was enough. II decided to see if I could find a gluten-free flour that was also kosher for Passover with which to fashion my GF matzoh balls. I even consulted the family Rabbi, who confirmed what I had hoped: quinoa is considered by most authorities to be kosher for Passover. Now, without delving into theological intricacies, I will mention that quinoa flakes may or may not be processed in a facility that is free of all off-limits-for-Passover grains, so if you’re on the more religiously observant side, you may want to err on the side of caution here. And that’s all I’ll say on that topic. Can you tell which is the “control” matzoh ball and which is the gluten-free one? It took two days and 8 different experiments, but I am happy to report that the following recipe produced a matzoh-less quinoa “matzoh ball” that is firm but not dense, fluffy but not overly feathery. It tastes like a matzoh ball is supposed to taste, and it’s made with whole grain, high-protein, quinoa flakes instead of starchy or heavy alternatives. * look for quinoa flakes in the hot cereal/oatmeal section of your grocery store, or order online from your favorite site. Ancient Harvest is the most well-known manufacturer. Measure out quinoa flakes and xanthan gum and combine in a small bowl. In a separate bowl, beat the two eggs. Add oil, salt and pepper and beat again until combined. Add the wet ingredients to the dry, mix well until combined. Cover and refrigerate for at least 30 minutes. Bring a large pot of water to a boil. (You don’t want the matzoh balls to be crowded). Cover pot and cook the quinoa balls, maintaining a rolling boil. Cook 40-45 minutes. To check for readiness, you can sacrifice one ball from the batch and cut into it. The center should be cooked through, not dark, dry or dense. Turn off heat and let the matzoh balls sit in the cooking water to set for another 30 minutes or so. Then, remove the balls from boiling water with a slotted spoon and let sit to cool for a few minutes. Refrigerate the balls until ready to serve. Before serving, place quinoa balls in pot of soup to warm them through. Serve, and accept heaping praise from your gluten-intolerant guests at what a considerate host you are. This is the fourth year in a row that I’ve brought my latke-making show on the road to my children’s school, staking out a corner in their classroom to fry up a seasonal storm of potato pancakes. My trusted sidekick is en electric skillet that’s over a half century old–it once belonged to a great aunt– which I break out precisely once per year. The electric skillet is my absolute favorite way to make latkes, as it keeps the oil temperature constant for evenly-cooked pancakes, and allows me to set up my frying station in any corner of the kitchen (or classroom) where there’s an outlet. While I’ve toyed with a variety of latke recipes over the years, my forray into classroom cooking required me to depart from the typical cannon: potatoes, onions, egg and flour or starch. That’s because my children’s former preschool was vegan, so I needed to find some sort of way to bind my batter without egg. I did experiment with some online eggless recipes that called for potato starch as the only binder, but I found that as the batter sat around in the mixing bowl waiting to be fried, potato liquid began pooling at the bottom, making the batter watery and necessitating ongoing attention with more and more starch to sop it up. Too much maintenance. I don’t know how the idea struck me back then, but I decided to see whether a bit of cooked oatmeal (from quick-cooking, gluten-free oats) might stand in as a batter binder instead. It worked like an absolute charm, and I’ve been making my latkes with oatmeal ever since. Using cooked oatmeal as a secret latke ingredient has other benefits besides binding, too. It keeps the recipe vegan and gluten free, which allows even diet restricted friends to partake of the deliciousness. The oatmeal coats the grated potatoes in a manner that seems to prevent them from browning, and it soaks up any liquid the potatoes may weep, as well; this means you can make the batter at home and transport it to a second location for cooking a little while later without a loss of quality or cohesiveness even as it sits. The following is my base recipe and technique. You can double it to feed larger crowds. Optional to serve: Applesauce, Sour Cream or Creme Fraiche (I like Green Valley Organics Lactose Free Sour Cream). Prepare oatmeal according to package directions, using slightly less water than it calls for to ensure a dense, thick oatmeal. Set aside. Squeeze grated onion over the sink to remove as much excess water as possible. Place onion in large mixing bowl when done. Grate potatoes one at a time. After finishing each potato, squeeze the gratings with both hands over the sink to remove excess water. Next, place the squeezed-out gratings in a horizontal line across the center of a spread out clean dishtowel. Fold the towel over to cover the gratings while you work on the rest of the potatoes. Repeat the grating-squeezing process with each of the remaining potatoes. When all 4 potatoes are grated and piled across the center of your dishtowel, roll up the towel lengthwise and twist the edges as tight as you can to squeeze out as much extra water from potatoes as humanly possible. (It will look like a long piece of taffy or a tootsie roll.) The towel should start feeling moist as the liquid soaks through. Keep squeezing and twisting for about a minute. Once all 4 potatoes are squeezed as dry as possible, place the shreds into the large mixing bowl, along with the onion. Add 1 tsp salt and the cooked oatmeal. Using your hands, combine the batter very well until fully blended. Heat oil in the electric skillet to 375 degrees until it is starting to shimmer. As oil heats, line a serving tray or large plate with paper towels. 8. Drop batter into the skillet in ~2 TBSP mounds, flattening them a bit to ensure they cook through. When edges are golden brown and latkes release easily from the pan, they’re ready to flip. Cook the second side until golden brown. Remove from skillet when done and place on paper towel lined plate, layering more paper towels as the plate fills. Add oil to the skillet as needed to ensure surface is well slicked as you continue to fry additional batches. While the rest of the world is testing the upper limit of their insulin sensitivity on Halloween, I prefer to treat myself to a delicious, savory and very righteous black-and-orange meal instead. Black quinoa-stuffed acorn squash fits the bill, both because the colors are right and because they are incredibly nutritious and delicious foods in their own right. (Subliminally, the fact that acorn squashes kind of look like mini pumpkins may have played a role, too.) Since I’m also on the hook to come up with a vegetarian entree option for our family’s Thanksgiving meal this year, I figured that developing this dish would give me a good practice run for the big day next month. It was the Thanksgiving angle that inspired the flavor profile of the quinoa stuffing, in fact. Why not stud it with Thanksgiving-stuffing-ish ingredients like savory sauteed onions, chestnuts, mushrooms, and sage to offset the sweetness of the squash? And why not top it with a garnish of roasted squash seeds while I was at it? Roast the acorn squash as follows: using your hands, rub the exposed squash flesh (flat part as well as the scooped-out cavity) with a thin layer of olive oil and sparse sprinkle of salt. Place squash halves flesh side up on a baking sheet and bake at 375 degrees until the flesh is soft and cooked through. (Depending on your oven and the size of the squash, this may take anywhere from 30-45 minutes, so keep an eye on them. ). When squash halves are roasted, remove from heat and set aside. While squash is roasting, cook the quinoa as per package directions and set aside when done. Heat 1 TBSP olive oil in a large saute pan; when hot, add minced onion and cook until it starts to soften and become translucent, about 4 minutes. Add the minced sage leaves and thyme leaves; stir until blended. Add the cooked quinoa to the vegetable mixture in the saucepan and stir until well-blended. Garnish with roasted acorn squash seeds (see directions below) and serve! Rinse seeds in a colander under running water to remove excess flesh/stringy membranes. Growing up, I never touched the cranberry sauce at Thanksgiving. Back then, my mom served the cloyingly-sweet jellied version, straight from a can, and I never quite understood the appeal. Fast forward to adulthood, when I had the good fortune to acquire a sister-in-law who is an expert maker of all things jelly and jam. She has taken on the annual Thanksgiving cranberry sauce-making, using fresh cranberries, a hint of orange zest, and only half the sugar called for by standard recipes. Finally, I came to appreciate the important role of this seasonal condiment on the Thanksgiving table beyond the gorgeous pop of magenta it provides on a plate dominated by brown-hued mounds ofcomfort food. When done right, a good cranberry sauce adds tart counterbalance to a meal dominated by earthy flavors, while the acid helps cut through the fat of those buttery mashed potatoes and gravy. After all, there’s plenty of sweetness come dessert time; I want my cranberry sauce to be a bit more on the tart side. If you’re in the market for a classic cranberry sauce that fits this bill and has 75% of the daily value of vitamin C to boot, here’s recipe #1: a simple Cranberry Sauce that’s just sweet enough. But if you’re going to go through the trouble of making a cranberry condiment from scratch, wouldn’t it be great to make one with legs beyond its one-meal-a-year debut at Thanksgiving dinner? After tinkering with a recipe provided by Chef Greg Aversa of Smokin’ Betty’s restaurant in Philly, I came up with a jam-like, chutney-ish spread that tastes sort of like a cranberry fig newton filling and has me finding all sorts of excuses to spread it on foods both savory and sweet. It’s a super-fast, beyond-easy and incredibly versatile condiment to have on hand as the holidays approach. In a saucepan over medium heat, combine figs, juice, molasses, mustard, sugar, pepper and salt. When figs are soft, transfer them to a food processor. Add the agave nectar or honey and pulse briefly until the mixture is an even texture. Now there’s a word–and food– that hasn’t passed my lips since going gluten free over a decade ago. I’ve scarcely even thought of blintzes in that time, until recently when I was challenged by my friends at Green Valley Organics Lactose-free, for whom I serve as consulting dietitian, to come up with some recipe ideas for the Jewish holiday of Shavuot in May. (Cue FTC disclosure music here!) Shavuot being a holiday in which it is customary to eat dairy foods, my mind went straight to Cheese Blintzes. And once I got cheese blintzes on the brain, I wasn’t able to shake them. The problem, of course, is that cheese blintzes are a veritable digestive Armageddon for people like me. All that lactose-rich creamy filling… the flour-based crepe… the dollop of sour cream on top… I’m getting cramps just thinking about it. It didn’t take long, however, to find workarounds to all of these problems. The biggest hurdle, as it turned out, was convincing myself that I am indeed the type of person who makes Cheese Blintzes from scratch. The last person on earth who made cheese blintzes from scratch, and this is a well-documented fact on Wikipedia, was my Grandma Esther (whose Salmon Croquette recipe you can snag here). And sometimes even *she* bought the frozen ones. You can imagine, then, my sheer surprise and delight to discover that making Cheese Blintzes from scratch is fast fast fast! And easy! It requires a very small number of ingredients which get combined in a matter of seconds. The filling need not be cooked… just measured out and mixed. You make some pancakes, scoop some filling, wrap the blintzes, and bake for 10 minutes. It was faster than cooking a pot of rice. The blintzes turned out to be pretty freaking spectacular. The crepe was so spongy, the filling so creamy and sweet… this gluten-free, lactose-free version is not compromised in any way from the original. I daresay I even like it better. Once you’ve made these blintzes, check out my gluten-free, lactose-friendly version of Grandma Mary’s Noodle Kugel… another Shavuot classic in which you can utilize the remainder of the Sour Cream and Cottage Cheese called for in the blintz recipe below. It’s a shanda to waste food, after all! *Note the difference between GF All Purpose Flour Blends vs GF All Purpose Baking Mixes. You want the former. The baking mixes contain chemical leavening agents like baking soda or baking powder and are NOT suitable for this recipe. Also, read the ingredients of your All Purpose Flour blend. If it contains xanthan gum or guar gum, you can omit the xanthan gum called for in the recipe, or add it sparingly as needed to achieve the desired texture of your batter. Lightly grease an 8- to 10-inch nonstick skillet with vegetable oil, like grapeseed or canola oil, and set aside. In a large bowl, whisk together the eggs and butter until well combined. Mix the flour blend with the xanthan gum and blend into the egg mixture. Pour in the milk in a slow, steady stream, whisking constantly until batter is smooth. Add more milk or flour by the tablespoon, if necessary, to ensure a smooth and thin batter. Cook the crepe until edges begin to brown slightly, about 2 to 3 minutes, and flip with a wide spatula. It will flip easily when ready. Cook the other side for about another 20 to 30 seconds until the pancake is set. Turn the pancake onto a plate lined with a moist tea towel and cover to keep warm. Repeat with remaining batter, layering pancakes one on top of the other. Cover after each addition. You do not need to re-oil the skillet in between pancakes. In a medium-size bowl, mix filling ingredients until well combined. You will likely have some extra, which you can use as a topping. Alternatively, save it for breakfast tomorrow and use it as a spread for toasted gluten free Cinnamon Raisin bread. To assemble blintzes, place one pancake flat on a plate. Place 2 TBSP filling on the flat pancake, about one-third of the way from the edge closest to you. Fold the bottom of the pancake over the filling, turn in the sides toward the middle and roll away from yourself to create a cylinder. Repeat with remaining pancakes. Fear not if the filling seems a bit too liquid; just wrap it carefully and place open seam down on the baking pan. It will all firm up during baking, and will turn out better than you could have imagined. Let blintzes sit for a few minutes before plating and serving to allow filling to set. Serve warm or at room temperature, plain or garnished with extra filling, lactose-free sour cream, or fruit compote. Kugel is a Jewish-style casserole, usually made either from noodles or potatoes, served as a traditional side dish to festive meals. Kugels can be sweet or savory, but are rarely gluten-free owing to their content of either egg noodles (for sweet noodle kugels) or flour (to bind potato kugels). My grandma Mary was a terrific baker, and I used to love her almost-sweet, slightly tangy, cinnamon-y noodle kugel; to me, it was at its best straight out of the pan from the refrigerator, as the cold temperature helped keep the layered concoction stay tightly bound into lovely squares of kugel perfection. Now that I have children of my own, I love sharing these family recipes with them. It's like giving them a taste of my own childhood. Since I was already planning to adjust my Grandma's recipe for gluten content so that I could actually eat it, I figured I might as well take down the lactose content as well so that all the digestively-deranged people in my extended family could enjoy it, too. Finding gluten-free egg noodles is easy nowadays; all the big kosher food companies sell them around Passover time, and you can get them online year-round as well. My gluten-free, modernized version is a terrific success. I've served it to guests in my home, brought it to my Rabbi's house for a potluck dinner, and even made a rainbow-colored version to serve passers-by for our town's annual Pride march. Who doesn't love a kugel? Cook noodles according to package directions in salted water. Drain well. In a large bowl, combine drained noodles with all ingredients. Your mixture will be very liquidy/soupy, but worry not! It comes together nicely during baking. Transfer mixture to a greased 9″ x 13″ casserole dish/baking pan. For best results, cool completely and refrigerate overnight. The cold will allow the egg/dairy proteins to firm up and hold your kugel together into a nice, coherent, sliceable casserole. Cut the kugel when cold into squares and then if desired, reheat the squares in a microwave. (You can also serve them cold–still tastes great.) Of course, the kugel will still taste divine if you serve the whole thing warm from the oven, but it won’t look as pretty since the slices will come apart more easily. For years, my mom has been making these crunchy biscotti to serve with tea at our Passover Seder. She calls them mandelbread (or mandelbrot), but I’m sorry– they are so very biscotti to me. More nuts than flour, kissed with cinnamon and subtly sweet, they are the perfect antidote to those heavy, cloying storebought passover desserts that sit in your stomach like lead. When I went gluten-free, so did my mom’s biscotti. When I became a dietitian, her biscotti went lower in sugar. Let’s hope neither of my children develops a nut allergy, or these lovely little cookies may not survive to see another Passover. Enjoy these at your Seder, and make them again this around the December holidays as a gluten-free treat to enjoy with hot cocoa or coffee. In large bowl mix nuts, raisins, cake meal, sugar, spices. Add eggs and mix with wooden spoon. If mixture does not hold together, add a little more egg. Divide dough in half and put it in 2 pans. Press very firmly to pack it down. Bake side by side in oven, reduced to 300 degrees, for 1 hour. Cool, turn over pans and release the biscotti. Cut them into 1/4 inch slices, then place them on cookie sheets to dry out in 200 degree oven for 45 min. on each side. This recipe is a brilliant riff on Hamentaschen–the traditional folded-triangle filled cookies that we Jewish folk eat on the early spring holiday of Purim. But I debated whether to even share it or not. On one hand, it’s extremely labor intensive– the dough is soft and melty like you’d expect a shortbread to be, and there is a lot of back and forth between active time and freezer time to get it right. On the other hand, the results are SO INCREDIBLY delicious, that perhaps it’s worth the trouble. The cookies are nutty and buttery and delicately textured; an absolutely indulgent treat. If you’ve got a season of something to catch up with on Netflix, perhaps you can devote a Saturday night to cookie-making and TV as my husband and I did; the stops and starts wont be as annoying when you’ve got high drama paused on your screen. I originally attempted a sandwich-style Hamentaschen instead of the traditional variety-- which involves rolling out a cookie dough, cutting it into circles, adding filling and folding up the edges-- because GF doughs can be sticky to work with in this way. But in a linzer scenario, all you need to do is roll out the dough, cut into triangles with a cookie cutter, and bake flat. Furthermore, since we’re using triangles, the shapes “tesselate”–meaning they can be cut back to back like tiles, leaving virtually no wasted scrap in between shapes. I recommend you cut the dough this way; it reduces the number of times you’ll need to consolidate scraps and re-roll the dough to make use of it all, since–as you will see–this is not a dough that likes to be worked. It cuts best when very cold, and once it starts warming, you’ll need to go back to the freezer for a few minutes in order to get your shapes cut and removed onto a baking tray with ease. Since the jam goes in AFTER the cookies are baked, each cookie retains a nice, full center of well-textured filling. You will want a stand mixer to do this type of recipe properly. Most of the gluten-free Linzer cookie recipes I consulted agree on this point. It’s best to cut out our triangle shapes with cookie cutters on parchment paper, and then transfer to a parchment-lined baking sheet. You will be making/baking two types of triangles: whole triangles (for the sandwich bottom), and ones with a mini triangle cutout (for the tops). I recommend making your first batch of triangles the cutout ones, so you can “recycle” the cutout dough back into the master dough ball to be re-rolled. You will need 2 sizes of triangular cookie cutters to make this recipe work easily. If your dough starts getting too soft and melty to work with, just return to the freezer for a few minutes to firm it up and try again. Preheat oven to 325°. Spread nut flour into a thin layer on a cookie sheet and roast for 15 minutes, stirring halfway through to ensure evenness. With a stand mixer or electric hand beater, beat butter with brown sugar until well mixed. Add egg and vanilla, mixing until well incorporated. Add gluten free flour mix, hazelnut flour, cinnamon, xanthan gum and salt. Beat until you’ve got a smooth dough. (It will be wet– but fear not.) Roll dough out between two pieces of parchment until it is 1/2-inch thick and freeze for 10 minutes. Do not roll too thin or the cookies will be too delicate to handle raw or break easily once baked. Remove dough from freezer/fridge and cut with triangular cookie cutters to desired size. Remove the excess dough from between the cookies. Using a spatula and working quickly, gently move the cookies to a parchment lined cookie sheet(s). Use a smaller cookie cutter (or knife) to cut mini-triangles out the centers of half of the cookies on a baking sheet. Ideally, segregate the cutout halves from the intact halves on different trays, as the ones with cutouts may have a slightly shorter baking time. Gently remove the inner shape with the tip of a small knife to keep from damaging the outer cookie. Place the baking sheet(s) in fridge to keep the cookies chilled. Repeat until you’ve used up all the dough. Once all the dough has been cut with cookie cutters and the shapes are arranged on a baking sheet, place the baking sheets in the refrigerator for 30 minutes. Preheat the oven to 325° while they are chilling. Bake cookies for 14 minutes, or until they are very lightly golden. Remove from oven and allow to cool on pan for 5 minutes before moving the cookies, with their attached piece of parchment, to a cooling rack. Allow to cool fully. If you are not serving in the next day or two, freeze the unadorned cookie halves as-is and remove/thaw when ready to decorate and fill. To serve: Arrange cutout halves (tops) on a working surface, and dust with confectioner’s sugar. Spread filling onto the intact triangle cookie bottoms. Top each frosted cookie bottom with a sugared cutout cookie top. Voila! When most of the country is prepping to stock up on holiday gifts each Black Friday, I’m doing some stockpiling of my own... at the local supermarket. For the brief weeks between Thanksgiving and Christmas, barrels of sweet, starchy fresh Chestnuts are available, ready to be roasted. In a season where centerfolds of over-the-top seasonal desserts beckon me from every glossy foodie magazine I encounter, there’s a lot to be said for finishing off a festive holiday gathering with communal bowls of fresh-roasted chestnuts instead. When the dinner plates are cleared and friends linger around the table over tea or wine, I find that slowly peeling away at a fresh chestnut is a calming ritual of sorts, preventing idle hands that might otherwise be tempted to make quick work of, say, an entire gooey pecan pie. Chestnuts finish off the meal with a hint of sweetness and lend themselves to being enjoyed slowly and shared among friends. Note that roasting times will vary by oven; look for the scores to start curling back as an indication that the chestnuts are done. Alternatively, you can take one out and test its done-ness by carefully peeling it (use a dishtowel or gloves…it’ll be hot!) and seeing if the nutmeat is nice and soft.